Southeast Louisiana CouncilCamping & Outdoor ProgramCampVBarGeneral Camp InformationC.O.P.E. C.O.P.E. was originated within the Boy Scouts of America at Camp Geiger, in the Pony Express Council, in the late 1970's under the direction of Parvin Bishop, then Scout Executive. Bishop later became Director of Program at the National Office and is currently Regional Director, Southern Region. C.O.P.E. 's origins are often traced back to European efforts. A Project C.O.P.E. course is operated under the oversight of a volunteer committee including National Camp School-certified directors. C.O.P.E. courses are built the strict standards of the Association for Challenge Course Technology and operated only under the direction of NCS-certified individuals. Standards of safety are stressed at every level of the course. Project C.O.P.E. courses typically include open areas for games and trust events, and a series of "low" and "high" elements. The concept of 'challenge by choice' encourages each person to participate fully while maintaining the right to 'opt-out' of any individual part of the program. Games introduce teamwork concepts while also serving as warm-up exercises. Trust events further the teamwork development while also developing risk-taking from low to higher levels. Low elements can include a wall, spider web, and other cable and rope combinations that involve teamwork relatively close to the ground. High elements are generally individual events involving climbing to heights of 20-30 feet, crossing cables, etc. Each element -- low or high -- is carefully spotted or belayed to minimize danger while still challenging the individuals to challenge personal levels of risk-taking. 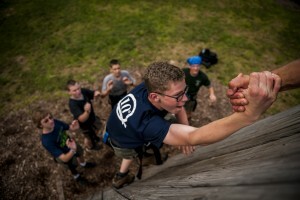 Climbing walls, rappelling towers, and similar elements are not, strictly-speaking, a part of the COPE concept, although they are currently supervised under the COPE standards. Separation of these programs is planned for the year 2000.